The American Association of Orthopaedic Medicine (AAOM) will host two advanced Regenerative Orthopaedic Medicine (IROM) clinics in sunny Cancun, Mexico this October. Active clinical experience. The master teachers will take part in the learning process side-by-side with the learner. The instructors will prepare the students to think differently, to view, consider and understand alternatives or change that can only be learned by example from experience. Experiential learning escalates growth. 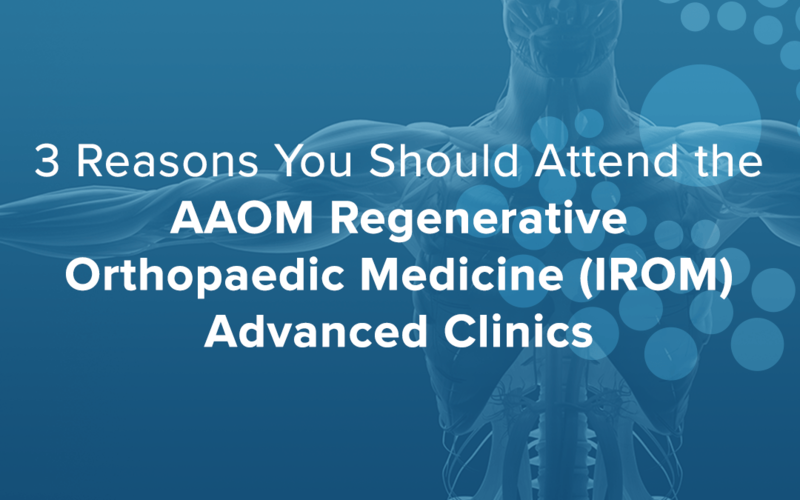 The AAOM IROM Advanced Clinics will plunge each learner right into practice, working on real patients with complex orthopedic concerns provoking a different way of thinking, evaluating, treating and practicing. Understand how interventional orthopedics fits into your practice. The AAOM Teachers will make Interventional Regenerative Orthopaedic Medicine understandable and practical, by using their own experience to demonstrate procedures, showing what, how and when to use IROM procedures and protocols and how to add and market in your practice. Click here to learn more about the courses and apply to attend.